Click here for 2019 individual results! Click here for 2019 group results! 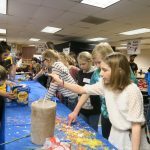 2019 Science Fair and STEM Festival in the news! 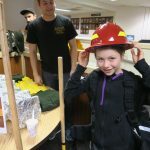 The 21st annual Western Upper Peninsula Science Fair and STEM Festival will take place on Tuesday, March 19, 2019 at the Memorial Union on Michigan Tech’s campus from 4:15-8:30 pm. The event is open to all 4th-8th grade students in Baraga, Keweenaw, Gogebic, Houghton, and Ontonagon Counties. The individual and group registration deadline is Friday, February 22nd. All forms and registration information are are located at http://www.wupstem.org . Students in grades 4-8 will submit projects on an investigation they conduct on any topic of interest, using the scientific process. Students will receive a Student Planning Guide that provides information about the science fair, worksheets that will lead students through the design and implementation of an investigation and a science fair project. 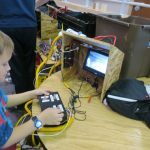 The design of a science fair project is an excellent way to engage students in the scientific and engineering practices of the new Michigan Science Standards. Students who receive Bronze, Silver or Gold rating at the Western UP Science Fair will have the opportunity to display their projects at the Carnegie Museum in Houghton, following the event. The science fair and festival is designed to be a family event. The public can view the science fair projects from 5:00-6:00pm in the ballroom of the Memorial Union. The STEM festival will take place from 4:30-7:00pm in Commons Area of the Memorial Union. 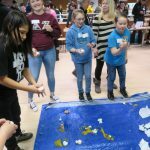 Michigan Tech students and faculty will provide a variety of hands-on science and engineering activities for K-8 students and their families. 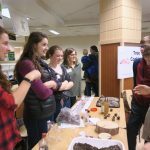 The STEM Festival provides students and their families with nearly thirty hands-on Science & Engineering activity stations led by Michigan Tech student organizations and community members. The community organizations that have conducted activities in past festivals were Society of Women Engineers, Delta Zeta, Alternative Energy Enterprise, to Mind Trekkers, Keweenaw Ojibwe Indian Community and Copper Country Recycling Initiative. 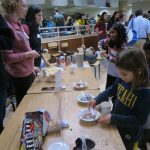 Examples of the types of activities were Making Concrete Aggregate Ice Cream, Marshmallow Toothpick Towers, Egg Drop, Remotely Operated Vehicles, Foundry in a Box, Bottle Terrariums, Friction Races, and so much more! Click here for 2018 individual results! Click here for 2018 group results!